It’s no secret that the girls and I are huge PB&J fans. 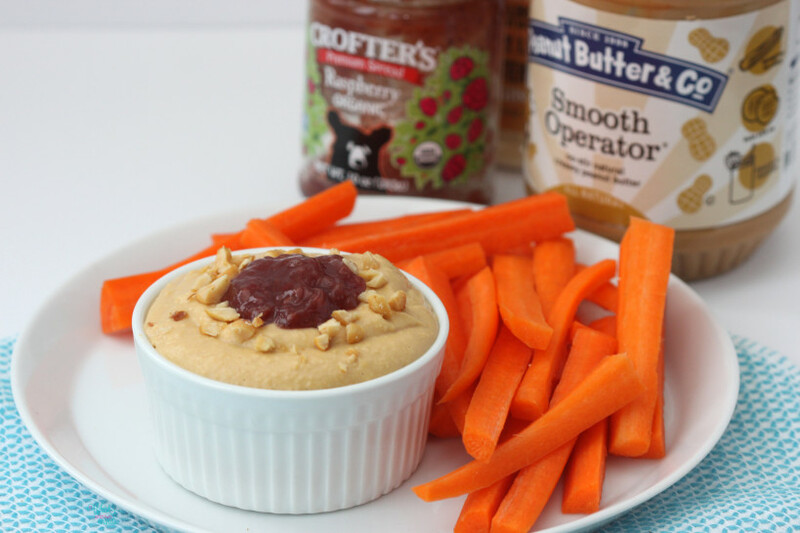 It is one of those simple combos that just can’t be beat, well maybe peanut butter and chocolate or peanut butter and bananas. Either way they all have peanut butter so really it’s no surprise they are all up there at the top. Even at my age, which I will not disclose because really it’s just a number, it is a nostalgic combo that brings me back to my childhood and the days the girls were little. One of the highlights of my day when A was little was what kind of peanut butter and jelly sandwich creation would we come up with. We use to call it art in the kitchen because they were just fun, to this day our Peanut Butter Bear Sandwich I posted 3 years ago and was one of my first posts still makes me smile. The girls are older and while we still love our PB&Js, I’ll still be eating them for lunch when I’m in my 90s, lunches are usually more veggies and fruits. The girls make their lunches pretty much any day and usually have vegetables, fruits, crackers, cheese, yogurt, muesli, chia seed drinks or pudding, smoothies, oatmeal, the list goes on and pb&js don’t make the list often. When they do it’s usually for a few days in a row. 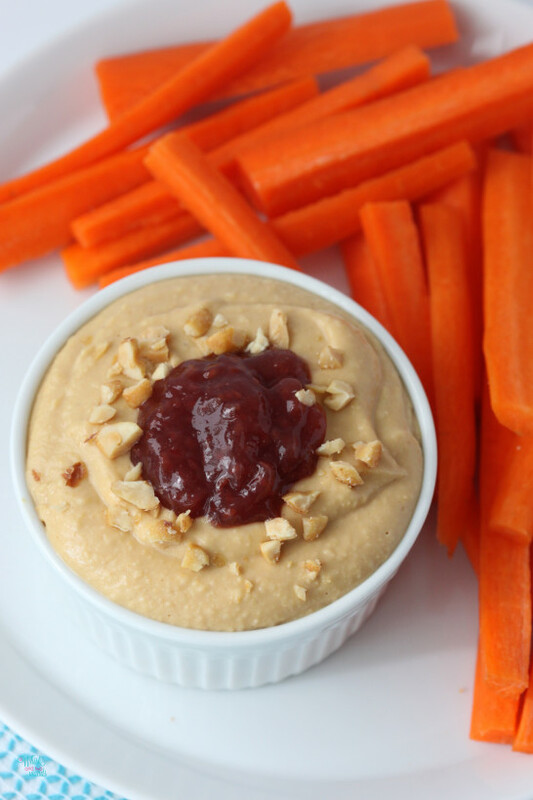 They still love peanut butter with their veggies or fruits so I had to have a little fun and whip up some PB&J Hummus for snack one day, and of course for lunches that week had it lasted. Good thing it’s easy to whip up another batch! Even the non hummus lover liked it! She likes many of the non traditional ones I make and I had a pretty good feeling this one wouldn’t be different. 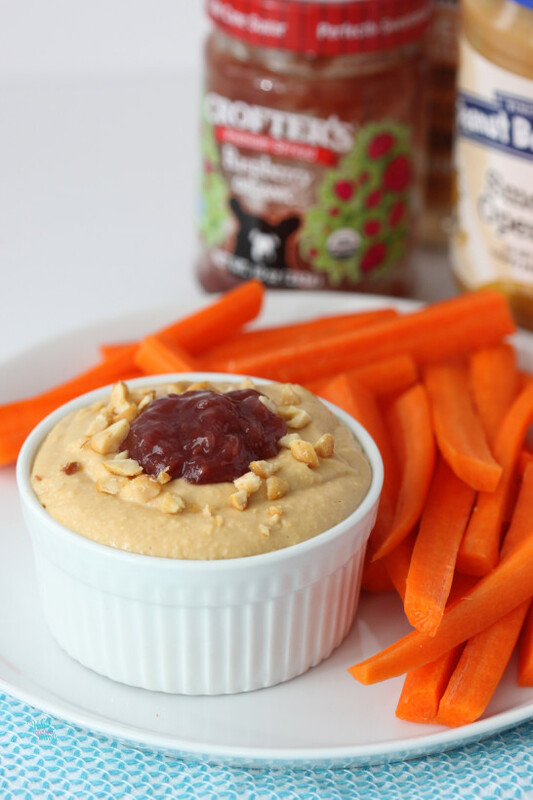 You can dip vegetables in it like regular hummus, carrots and celery are great! Or fruits like strawberries, apple slices, or bananas. Spread it on a sandwich, toast, or crackers. The options are endless! 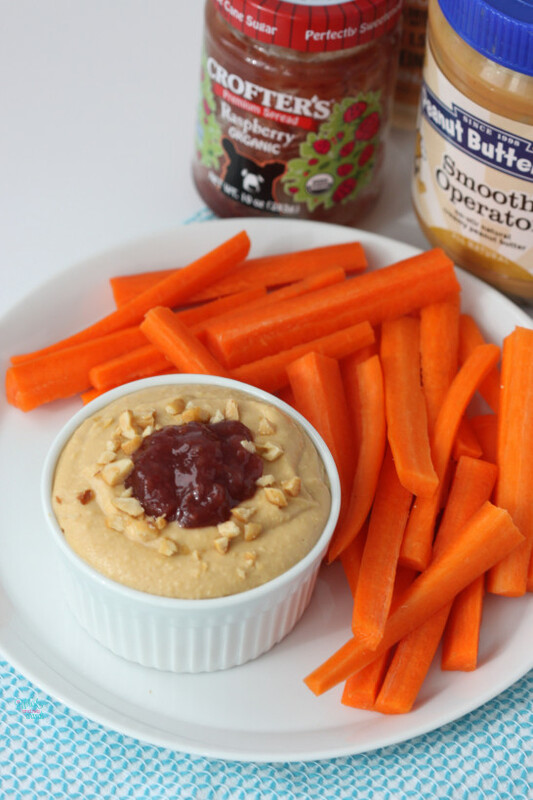 Being a hummus and peanut butter lover I have been trying it on everything! 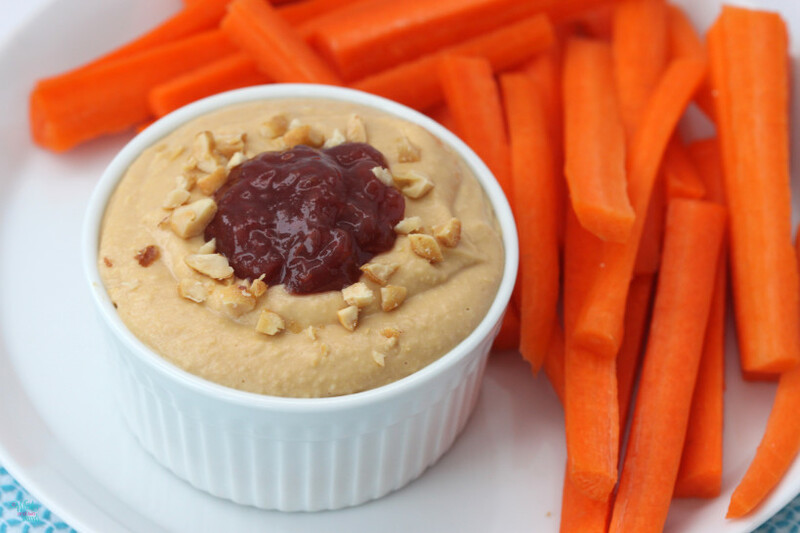 Blend chickpeas in a food processor for about a minute. Add in peanut butter, and maple syrup, blend until combined. Add in peanut butter powder and blend, while blending stream in coconut milk starting with 1/4 of a cup adding more as needed to desired consistency. 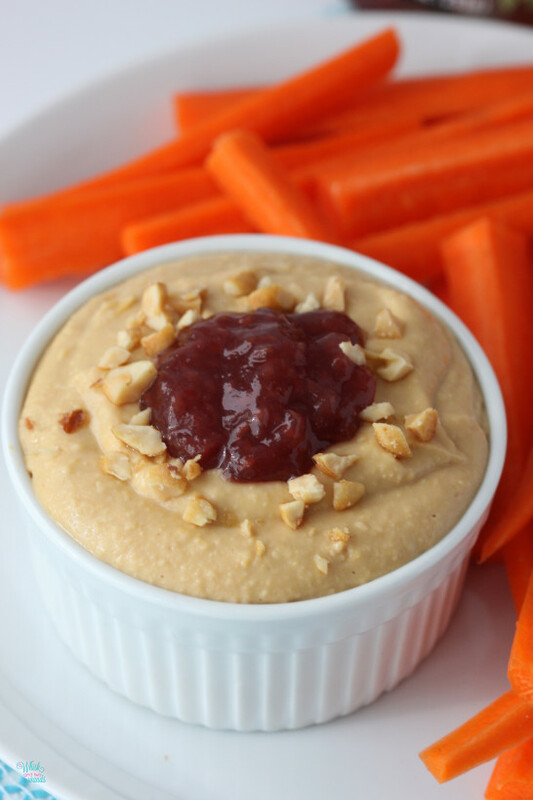 Top or serve with chopped peanuts and jam before serving. Store in an airtight container in the refrigerator and enjoy within 3-5 days. chick peas and peanut butter how interesting! How much vanilla? I don’t see it in the ingredients. Thanks! Unsweetened vanilla (flavored) non dairy milk.